Julep Oxygen Brightening Nail Treatment – This little gem helps to conceal discoloration. It also helps to brighten your nails through lemon extract and it claims to deliver oxygen to your nail beds to encourage strong and healthy growth. Julep Your Cuticles Look Thirsty – This is a creme cuticle moisturizer with shea butter and honey. I like how it absorbs fairly fast so it doesn’t slow me down. Julep Poppy nail polish – a nice bright red. I chose this color because of the 4th of July and Labor Day festivities that were coming up. Plus every woman needs a bold, bright red polish. 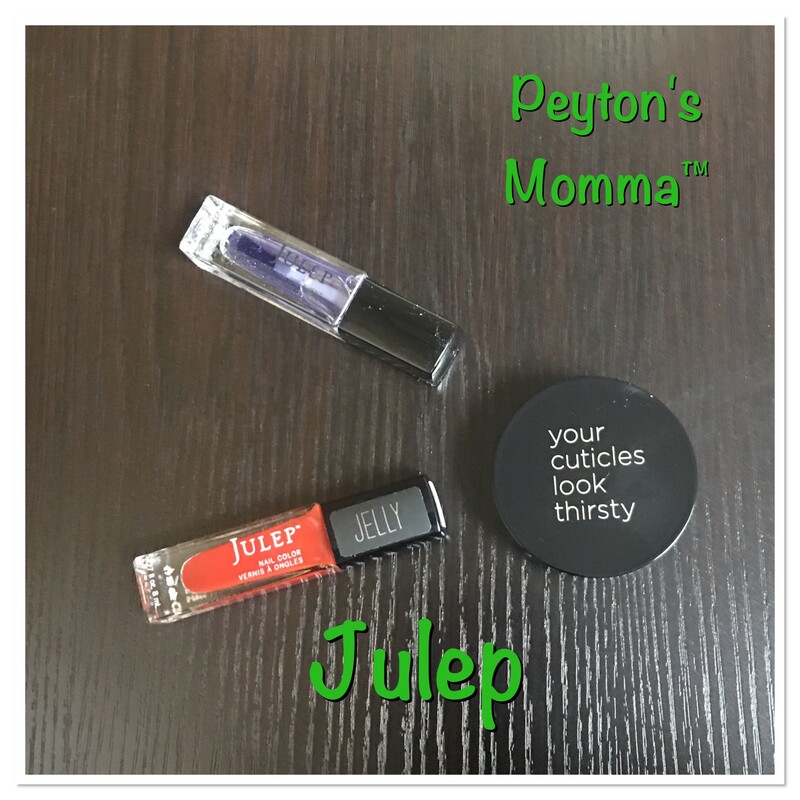 Julep always sends along a little piece of candy or two in each month’s box. Peyton has learned there are treats in every box so she keeps an eye out for our monthly purple box and usually gets it open before I do. Then she steals the treat, closes the box back up and never says a word. Some of the reasons I like my Julep subscription is because I can modify it. Every month I receive and email telling me I can log in and see what has been chosen for me. From there, I can customize my box. I can take out 1 item or all the items chosen for me and add back in items I want to try. And the price still stays the same. Plus while I’m in there making my selection I get access to discounted items I can choose to have shipped with my box! If you are thinking of trying out a Julep box go for it! Here’s a link to sign up. You can cancel at any time or even skip a box or skip several boxes if you want. Julep is the most flexible subscription box I’ve come across.